On Monday, January 12th, Stonehouse was treated to a performance of Sergei Prokofiev’s Peter and the Wolf. 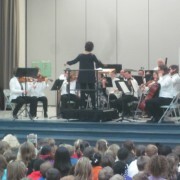 A 20-member ensemble from the Williamsburg Symphonia (orchestra) excited students with story telling through music. This educational and cultural experience was made possible by a generous donor, Mr. John Jamison.